Pasta, Oh Pasta! I have a little bit of a weakness for pasta, yet sometimes I find myself afraid to make pasta. The fear is mostly that I will make something bland and flat, it can happen with pasta. This recipe is a kind of mixture of the bold flavours I was craving! 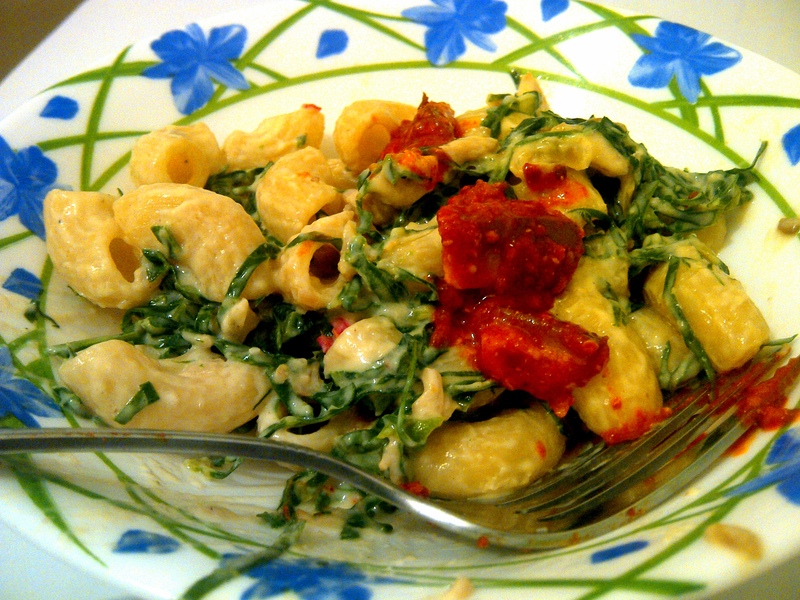 Garlic, chillies, spinach, and of course cream. I know what you’re thinking; craving all those things at the same time? Trust me that’s not even bad, I had to limit myself or else we would have avocado and goat cheese in the pasta too! First, cook the pasta according to packet instructions. Which really just means, cook in a pot of boiling water, add some olive oil and salt for about 8-10 minutes, until al dente. Next, take the chicken breast and sprinkle with salt and pepper. Be generous. Heat oil in a large frying pan. Add the chunks of chicken in a single layer and leave to brown for a minute or two without turning. Turn the chicken and brown on all sides, cook until done, remove chicken and set aside. Lower the heat to medium, add the garlic and chillies. Stir quickly for 30 seconds to avoid burning. Pour in the wine, let it bubble and reduce by at least half. Turn the heat down low, add the spinach and chicken. Stir in the cooked pasta and the cream, make sure everything is nicely coated. Take off the heat, salt and pepper. If you have some Parmesan cheese, shave some on to the pasta before serving. I added a dollop of mango pickle to my pasta, just for the sake of it! I tend to look at adding mango pickle like that little box of naughtiness under your bed… Sometimes you have to whip it out to add some flavour… If you know what I mean!